A recent episode of 5-Star Spells discussed the use of animals in magic. The Lovely Sarah over at Forest Grove also did an excellent post on the use of bones in magic (a topic I’m also working on but which will probably not be nearly as comprehensive as her fantastic article). Gillian’s creature-feature over at Iron Powaqa has also gotten me thinking more and more about animals and their use or place within magical work. I’ve covered animals a bit before (see my post on Snakes for example) and I’ll likely continue to explore those individual species in other articles, but today I thought I’d tackle the topic generally. When animals appear in American magical lore, which ones crop up most often? Are they alive or dead? Are their parts used in magic (like the Rabbit’s Foot), or do they themselves represent something more significant as whole, intact creatures? 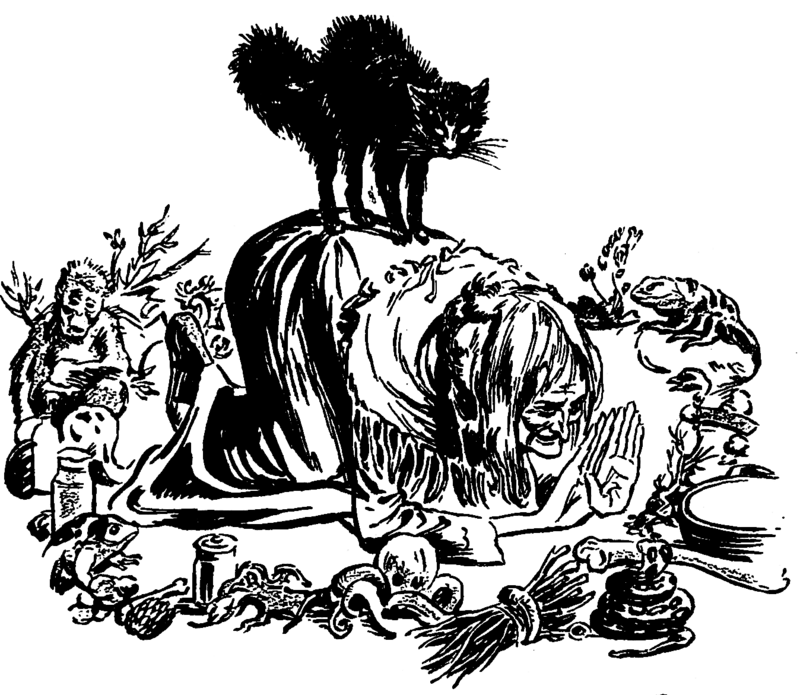 Cat – The ubiquitous black cat of magical lore appears in all sorts of stories. Patrick W. Gainer relates a tale about a witch who turns herself into a cat and then murders the men her father hires to work in his mill. In Spooky South, S. E. Schlosser describes a blacksmith whose wife slips in and out of a catskin every night until he outwits her by salting her human skin while she’s away. There’s also the story of the Wampus Cat, a fearsome cat-like beast which terrified Native Americans and early colonists in the Southern Appalachians. And of course, the powerful magical charm of the black cat bone has been discussed on the blog and podcast before. There are probably dozens, if not hundreds, of cat-related stories connected to witchcraft and magic in North America, and while having a black cat weaving about one’s feet certainly isn’t a requirement for witchery, it does seem to be encouraged. There are also a number of stories from all around the country related to ghostly black or white dogs who presage death or misfortune. These seem to be similar to the “Black Shuck” dogs found in English folklore (and which served as a roundabout inspiration for the Sherlock Holmes tale “The Hound of the Baskervilles”). Wolves show up from time to time in Northern and Pacific Northwestern lore, though they usually do not have the fearsome associations found in European stories but rather serve as guides or helpers to lost or wounded folks. Though the element of danger sometimes hovers around the magical canine, for the most part they seem to act as allies to magical folk in North America. Snakes – As I said earlier, I’ve posted on snakes before, but a quick rehash can’t hurt. The reputation of the serpent in North America seems to have been tainted by the negative impressions of it transmitted through Christianity. Yet it remains one of the most significant magical animals in American magic, too. Even some Christians engage in ceremonies with snakes, handling them as a test of faith in accordance with Mark 16: 17-18. Marie Laveau was known to dance with a large snake called Zombi during her famous St. John’s Eve celebrations in New Orleans (described in Zora Neale Hurston’s Mules and Men), thus cementing the serpent into the NOLA Voodoo tradition. Snake parts are common in magical practice, with rattlesnake rattles being lucky and the shed skins and eggs being useful for cursing and negative work. I like using snakes myself, as I enjoy their chthonic symbolism and ambivalent quality. I remember making a rather nice Damballah altar jar for a friend containing a long snakeskin and bones, inscribed with the lwa’s veve on the front—it was beautiful and felt like it radiated power when I finished it. So yeah, I’ve got a fondness for the slithery beasts. At least, when I’m wearing boots I do. “Spitter, Spitter, spider, tell me wher that (name of the article) is and I’ll give you a drink of cider” (p. 125). There are plenty of other little bits of lore regarding six-and-eight-legged creatures, but I’ll save those for a longer entry sometime in the future. I’m going to stop here for today, but we’re not done with magical creatures yet, by any stretch of the imagination. If you have animal lore you’d like to share about any of the creatures mentioned so far, though, please do!